Foliage: cluster of erect, basal leaves, up to 20 cm long. 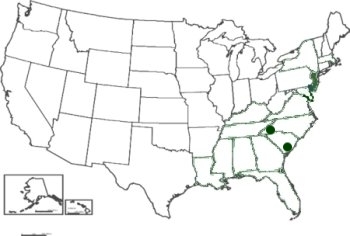 Deer herbivor and succession of bogs as well as hydrological changes are threats to Narthecium americanum. 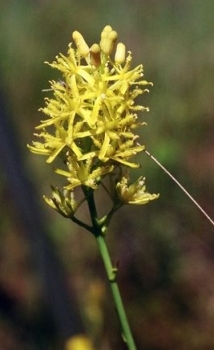 Witmer Stone writes of bog asphodel: "This remarkable plant was discovered by Frederick Pursh (1774-1820), one of the first botanists to publish on the Pine Barrens flora, on one of his excursions in the swamps about Quaker Bridge. At the time Dr. Britton's Catalogue was published, seventy-five years later, there were but five stations known where it grew, while to-day I have seen specimens from only a dozen, all of which lie between Tom's River on the north and Atsion and Pleasant Mills on the south, mostly east of the New Jersey Southern Railroad--roughly speaking an area twenty by thirty miles. 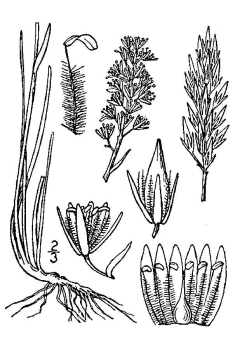 This has been supposed to be the only spt in the world where the plant occurs, but in the Commons herbarium at the Academy of Natural Sciences, Philadelphia, there are specimens of both Abama and Tofieldia from near Lewes, Delaware, collected by Mr. Albert Commons, August 1 and 15, 1895, respectively. Probably some of the older localities are now extinct, as the Abama is one of those plants which are exterminated by cranberry culture. The damming and flooding of the bogs covers the low wet sandy spots frequented by the plant and it disappears--at least I have never been able to find it on the edges of cultivated bogs. On the branches of the Wading River about Chatsworth and Speedwell, where broad, wet sandy bogs abound, I have seen great patches of Abama, the short stiff leaves curving up from the root stalks in the thick ranks like short grass, and the yellow spikes standing close together make a golden sheen over the bog that can be seen at quite a distance. Even when in fruit they make quite a show, the seed capsules being rich reddish brown and the stalks and bracts buff like wheat chaff" (339). Narthecium, or Abama, as it was referred to in Stone's time, has been extirpated from Delaware. Small pockets exist in South and North Carolina.